As dawn breaks over the Pont Neuf, and the cobbled alleyways of Paris come to life, Anna Trent is already awake and at work; mixing and stirring the finest, smoothes, richest chocolate: made entirely by hand, it is sold to the grandose dames of Paris. Up until now I have never really felt the desire to visit Paris. Yes I know of readers who adore Paris, but I have always been happy to sit back happily in my own chair. 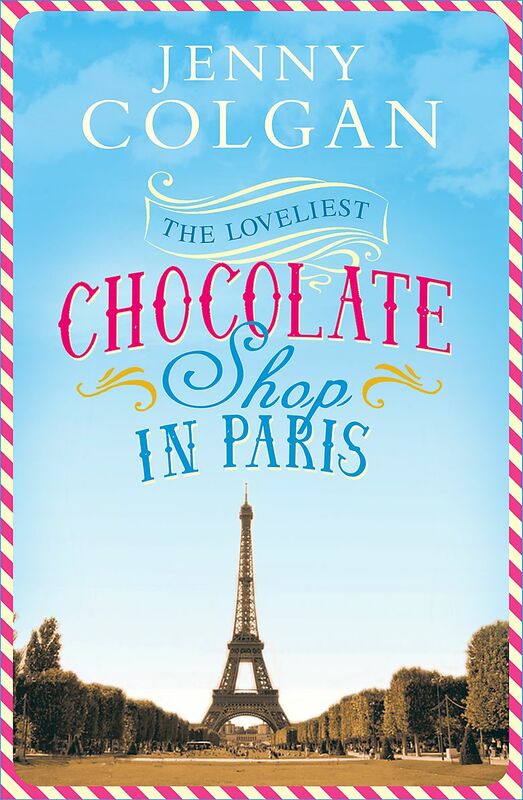 What Jenny Colgan manages to achieve in her book The Loveliest Chocolate Shop in Paris, is to have me totally in love with the sights and sounds, food and... chocolate of Paris. She makes me want to experience it for myself. I absolutely loved this book. It made me chuckle out loud, as well it had me feeling deep sadness for some of the characters. There's a bittersweetness to it. As you would expect from the title of the book there is a lot about chocolate, and yes I admit to having to reach for some as I read! However I am sure it would not have come up to the standard of Thierry, his workers, Laurent and Anna. I loved the whole chocolate making business - a work of art, and I am sure a delight to the taste buds. I came to know and love all the main characters in this story. Anna - struggling after a freak accident who takes up the offer to try something new and fresh in an unknown city. Claire her mentor, who so many years ago met Thierry in Paris and had a whole wonderful experience there. What these two learn about their life as the book develops was precious. Thierry the chocolatier - larger than life, well larger than most people too. He has the temperament of an artist, and he has a big heart too. There is his son Laurent - estranged from his father and the whole history of that relationship was fascinating. Then there is Alice - the woman Thierry loved last. At first she seems a little very strange. However I have to say I came to feel for her too. The Loveliest Chocolate Shop in Paris was a delicious read. It had everything in it I could ask of a book. Oh, and the very yummy recipes at the end. And you guessed right - of course they all have chocolate in them! Jenny Colgan is the author of numerous bestselling novels, including Christmas at the Cupcake Cafe, and Little Beach Street Bakery. Meet Me at the Cupcake Cafe won the 2012 Melissa Nathan Award for Comedy Romance and was a Sunday Times Top Ten bestseller, as was Welcome to Rosie Hopkins' Sweetshop of Dreams, which won the RNA Romantic Novel of the Year Award 2013. Jenny is married with three children and lives in Scotland. Ooh! Just found out my library carries hard copies :O). Great actually I must look in my library to see what they have by her. I've been wanting to read this one based off the title alone and now I'm really looking forward to it. This sounds amazing! I love the sound of the characters and I love books that make you want to visit some place else. I can't wait to settle in with this book and I'll make sure I have a box of chocolate handy! It was a great mix of Paris, characters and chocolate. I'd heard of these books by JC and this one was a gem. The title alone has me sold! I know! Paris and chocolate - gotta win! Great review Kathryn! I am looking forward to reading this one. I enjoyed one of Colgan's earlier books, Meet Me At The Cupcake Cafe. Yes I am looking forward to another read of her books now I have started! I have read this author before, and loved her writing style. You really feel like you are right there in the story. Considering my affinity for chocolate, this one sounds like a must read for me! Yes exactly, her details are interesting and evocative. This book sounds delicious! What better way to visit Paris, than through a book or movie, I say...but if the chocolate feels as though it needs to be experienced first hand, I guess the reader might have to get out of her chair. Thanks for the great review. I would love to try chocolate made like the chocolatier in this book but not sure of my chances! I may never get there but if I do I'll be looking for book shops and chocolate shops!